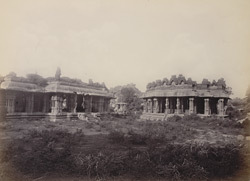 Photograph of the ruins at Vijayanagara from the 'Photographs to Illustrate the Ancient Architecture of Southern Indian' collection, taken by Edmund David Lyon in c. 1868. Vijayanagara, the City of Victory, was the most powerful Hindu kingdom in Southern India from 1336 until the defeat by the Muslim armies in 1565. It was built on the bank of the Tungabhadra River and is surrounded by granite hills. The ruins of this vast royal city incorporate distinct zones and are divided into two main groups, the sacred centre and the royal centre. This photograph features the Garuda shrine in the form of a stone chariot in the centre, with mandapas to either side. These structures are all a part of the Vitthala Temple complex.